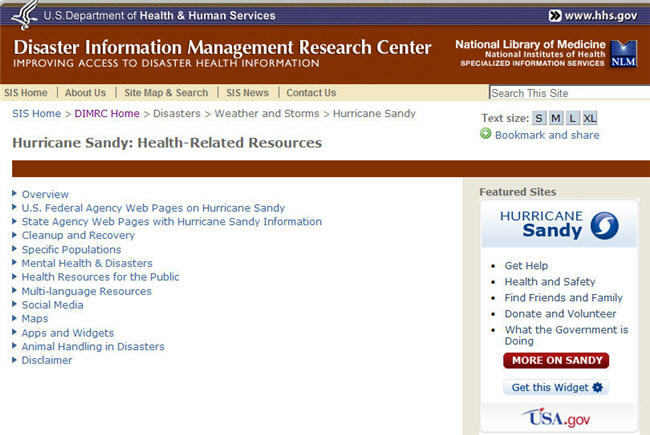 The National Library of Medicine Disaster Information Management Research Center (DIMRC) has compiled a list of health information resources for Hurricane Sandy. The Hurricane Sandy: Health-Related Resources page has links to overviews; state specific pages; cleanup and recovery information; mental health information; multi-language resources; social media information; apps and widgets, and more. The Disaster Information Management Research Center develops and provides access to health information resources and technology for disaster preparedness, response, and recovery. What Does a Library Have to Do with Disasters?